Consumers at post offices across the UK face a "big change" on Monday as branches implement radical changes to mail charges, says a consumer watchdog. Royal Mail will now price mail by size as well as weight. But it said 80% of post will cost the same amount to send. A spokesman for watchdog Postwatch, Daryl Barrett, said consumers should take the time to understand the new system so as to pay the right price. "It's a big change. It's about being aware of how to save money," she said. Postwatch has raised concerns about how the costs would be introduced and has advised consumers to take time to study the new scheme. Ms Barrett cited the example of a one-page A4 letter, which would cost 44p to post. By folding the letter in half, the letter becomes C5 size, and would cost 32p. Royal Mail said it was introducing the charges to reflect the cost of sorting large letters, which has to be done manually instead of by machine. Postwatch said it accepted the rationale behind the changes, which was being driven by postal competition being introduced into the market later this year. But Caroline Elsie, the managing director of the CMD Personnel Consultancy, told the BBC her company would end up paying more because it posts a lot of material in large envelopes. "This will probably cost us an extra £120-130 a year - just another burden for a small business," she said. 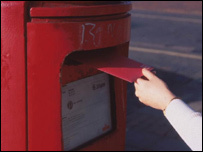 Postwatch said it expected the full impact of the changes to be felt around Christmas, when greater numbers of consumers used the mail system. Postwatch said it was concerned some smaller post offices were not prepared. A Postwatch survey of 307 branches early in August found a third were not ready for the change. A third had not put up posters about the change and 34% had no template to check the size of post, Postwatch said. The survey also found there were no leaflets about the changes at 32% of offices. 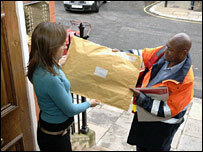 A Royal Mail spokesman said the survey was conducted before posters and other information had been fully distributed. They also said staff had been trained in the changes.